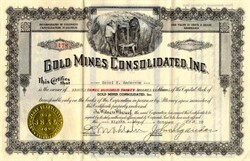 Beautifully engraved certificate from the Gold Mines Consolidated, Inc. issued in no later than 1949. This historic document has an ornate border around it with a vignette of men working in a mine. This item is hand signed by the company’s president (K. M. Ohlander) and secretary and is over 55 years old. The company had a 40 ton floatation plant and a 100 ton concentrator. They produced 45 tons of ore daily in 1941 and had 26 men working.